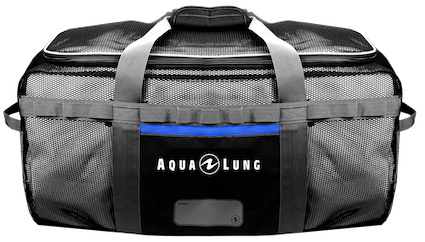 The Aqua Lung Explorer Mesh Duffel is the ideal excursions bag for your dive trip. Its padded air mesh walls will protect delicate gear and allow it to dry quickly. 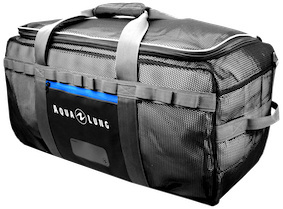 The front of the bag has anchor loops which can be used to mount easy access gear with carabineers or to secure the bag to the deck of a boat. 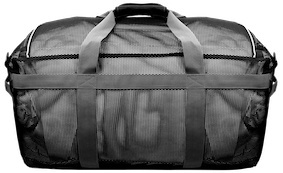 The compact design folds to 3 x 9.5 x 14.5 inches (8 x 24 x 37 cm) for easy packing and storage on long trips. The Tarpaulin sleeve pocket is designed to hold small items and also provides a dry spot for your hip while carrying the bag.